Yay! It is finally yard sale season again. This season is bittersweet for me this year as I’m trying to cut back on my treasures. Yes, we are doing some major de-cluttering at the house so it will be more thoughtful treasures that make their way home this year. It is too hard to give up treasure hunting all together, so I must learn to make fewer and wiser purchases when I find those treasures. 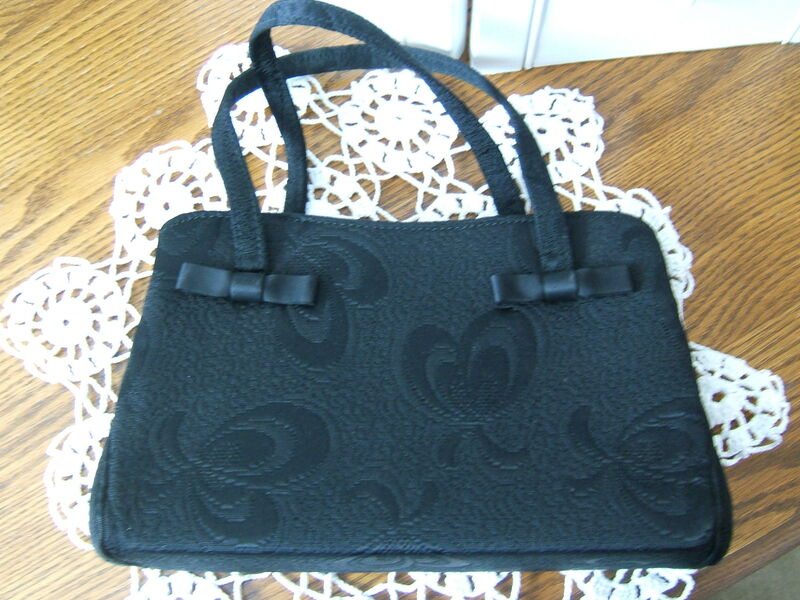 I have bypassed quite a few yard sales since the season began. 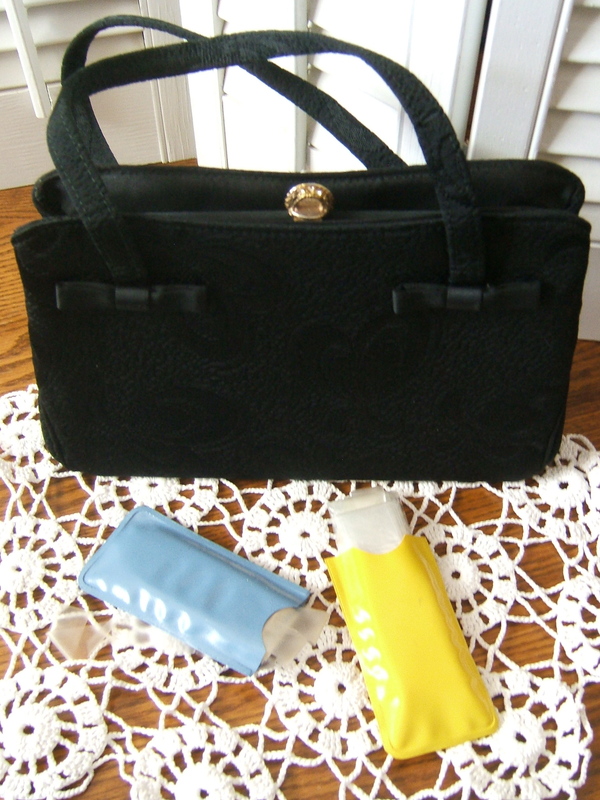 I couldn’t pass up the estate sale held by one of my bridesmaids. 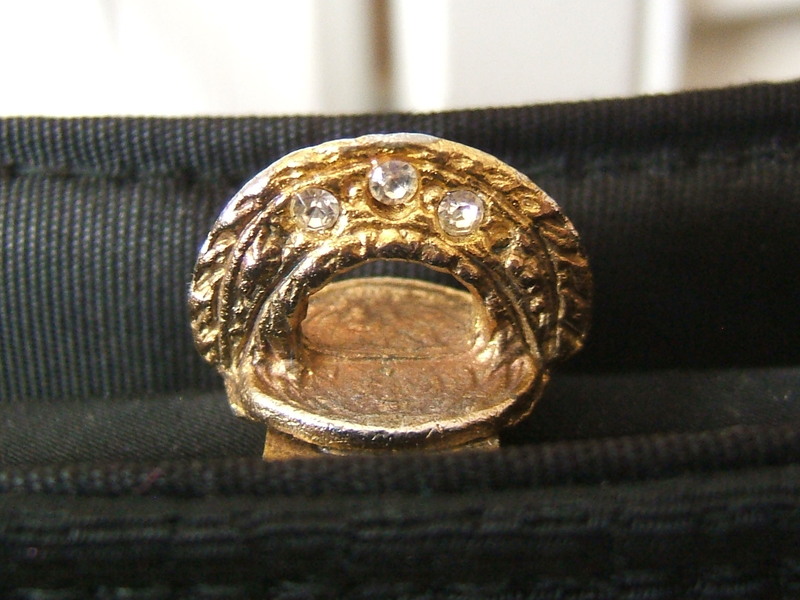 The estate sale was at the home where she grew up; I just knew there would be a treasure waiting for me. 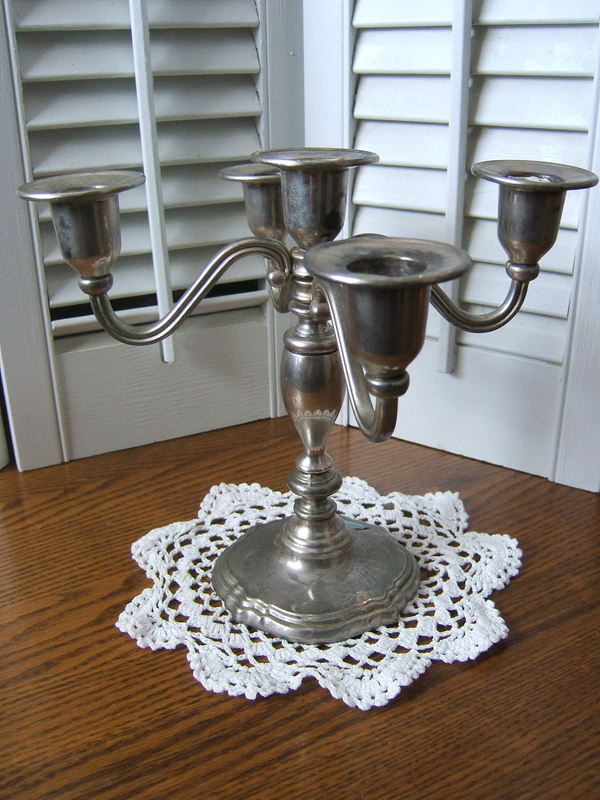 I found the lovely 5-cup International Silver Company silver-plated candelabra at the sale. 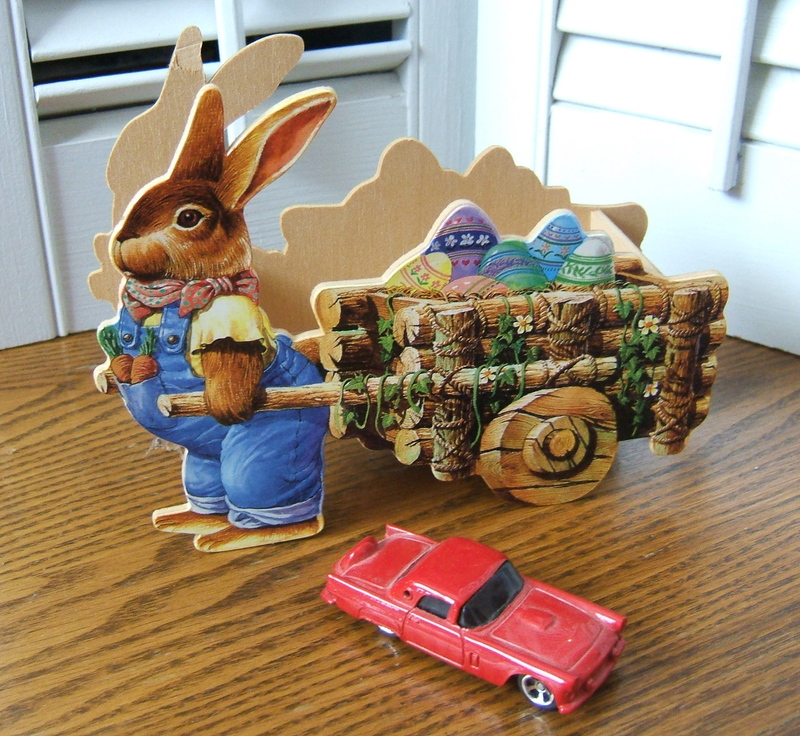 I really like the size of this; it will fit into a tablescape quite nicely. 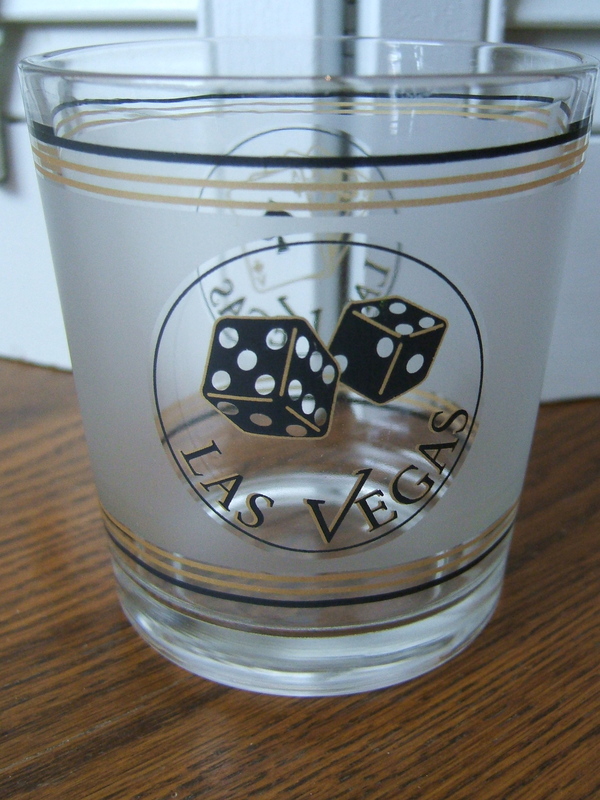 I also picked up a treasure for the husband of my friend, “S”, who collects Las Vegas items. I thought he would like this for his collection. This bunny was just too cute to leave behind. He will be added to my office decorations for use next year. He held a treat inside – a Maisto red 1956 Ford Thunderbird die-cast car. 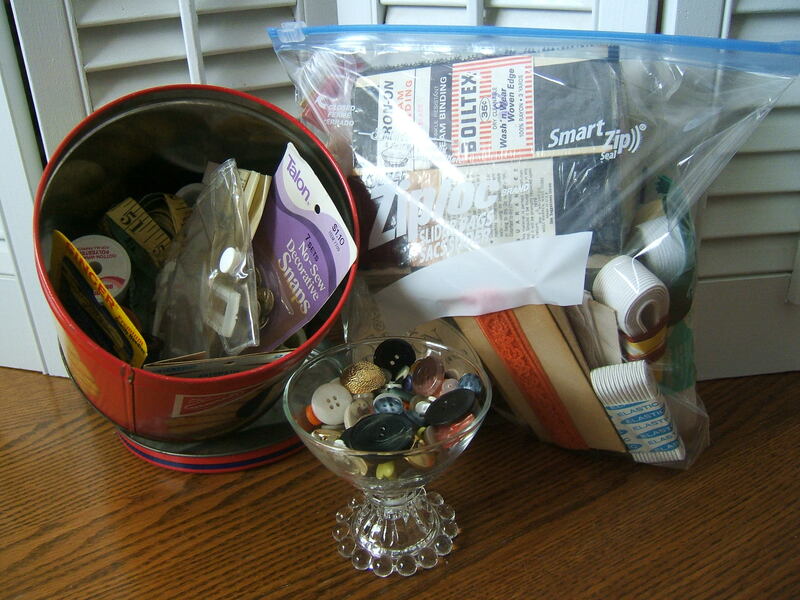 And lastly, you know I can’t pass up vintage sewing stuff and buttons! 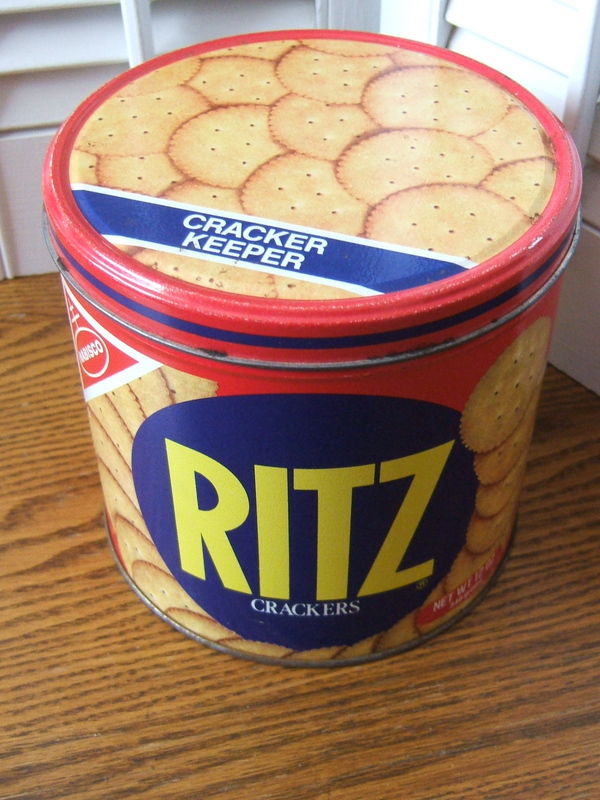 This vintage Ritz cracker tin filled to the brim with sewing goodies was in a box marked $1 which also included lots of thread and other sewing items. Lots of goodies in here! I think I did very well for $4.50 total. 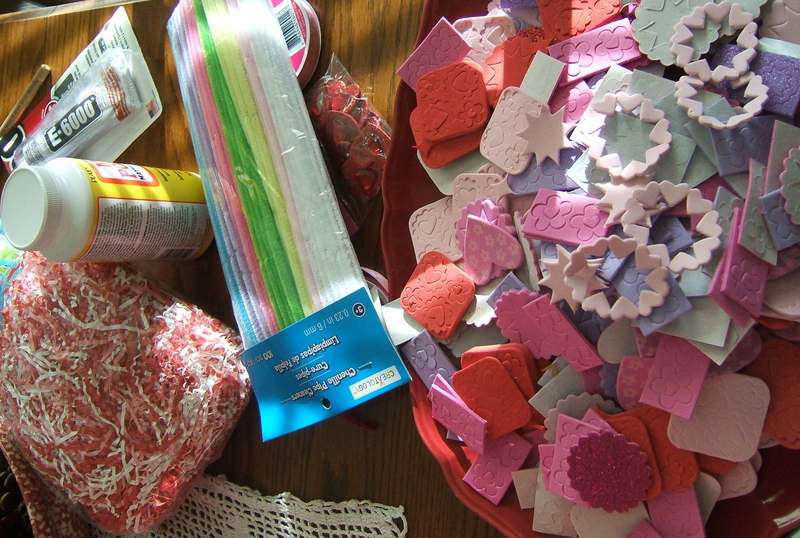 Some treasures to keep, some to gift, and a few extra sewing items will be donated. And the best treasure of all, I got to see my sweet bridesmaid, who hasn’t changed a lick in all these many years…still as lovely inside and out as always. I hope to visit the following parties, and hope you will too, at Knick of Time’s Knick of Time Tuesday, Nifty Thrifty Tuesdays at Coastal Charm, Thrifty Things Friday at The Thrifty Groove, and The Penny Worthy Project at Hey, What’s for Dinner Mom? In another twist of the question, Where Does Time Go?, my long-time friend and fellow thrifter, S, is celebrating the upcoming marriage of her youngest child. Since it seems like yesterday that she and I were celebrating our own new marriages, it feels as if I’m in a weird warp of time. 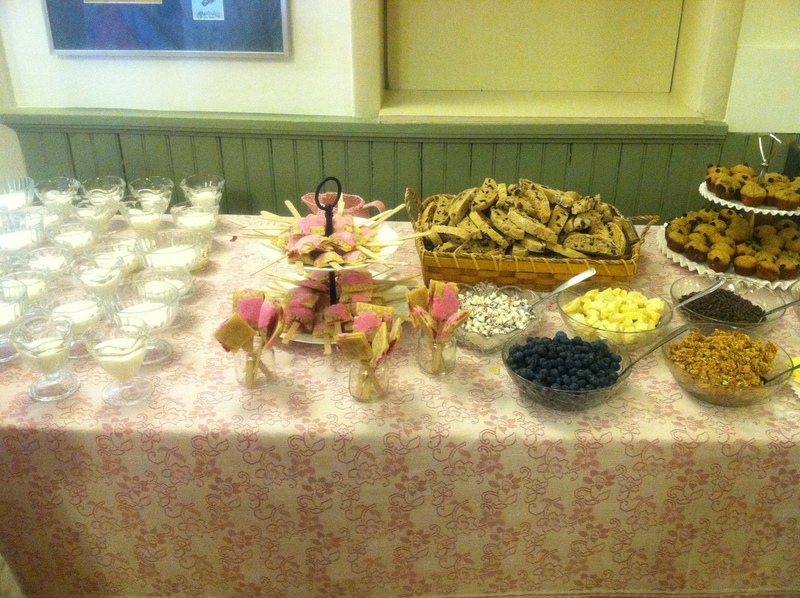 The adorable bride-to-be and her sweet momma decided on a Tea Party theme for her bridal shower. For months, S has been collecting tea cups and saucers, plates, mason jars, flatware and serving pieces during her thrifting adventures. Many of these pieces were brought out to play at the tea. 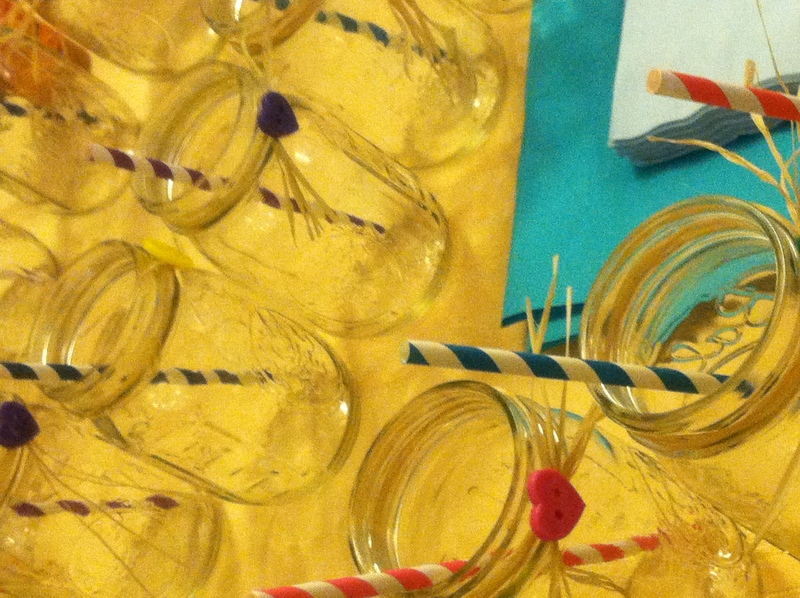 For those who preferred a cold beverage, mason jars were fancied up and loaded with fun straws. 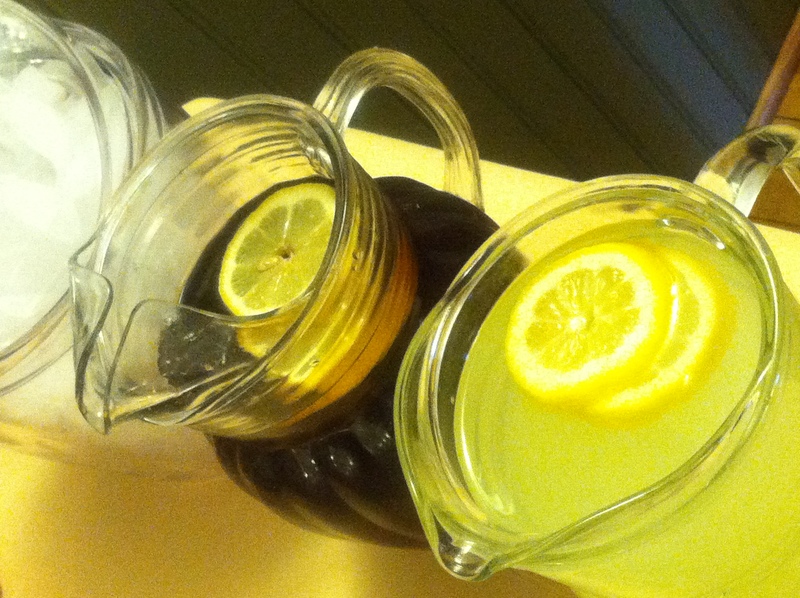 Iced tea and lemonade were available to quench thirsts. 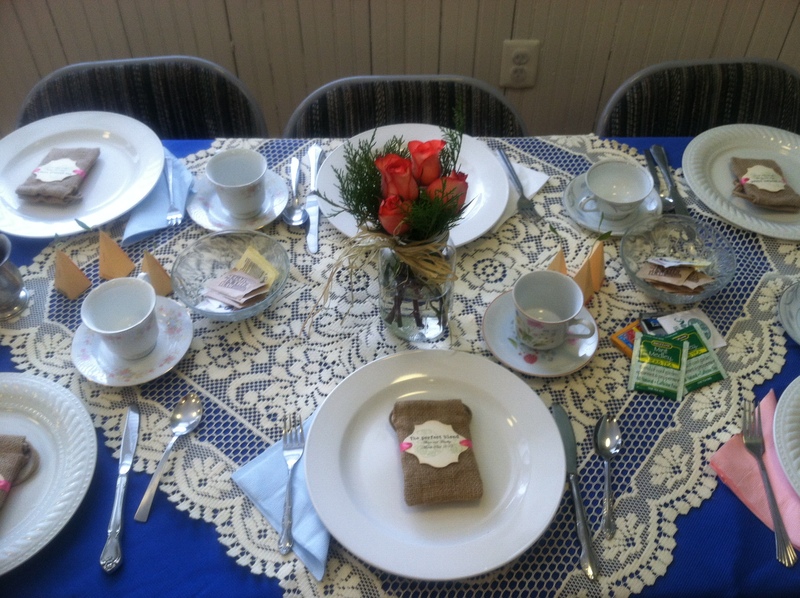 Each table was set with a mix of plates and tea cups. 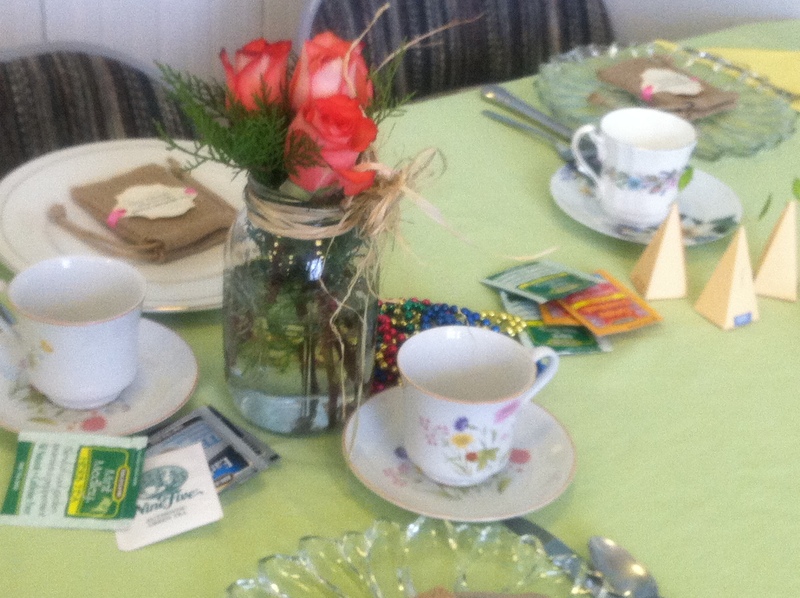 Mason jars were utilized again as vases for beautiful floral displays on each table. A fine selection of tea was provided at each table. 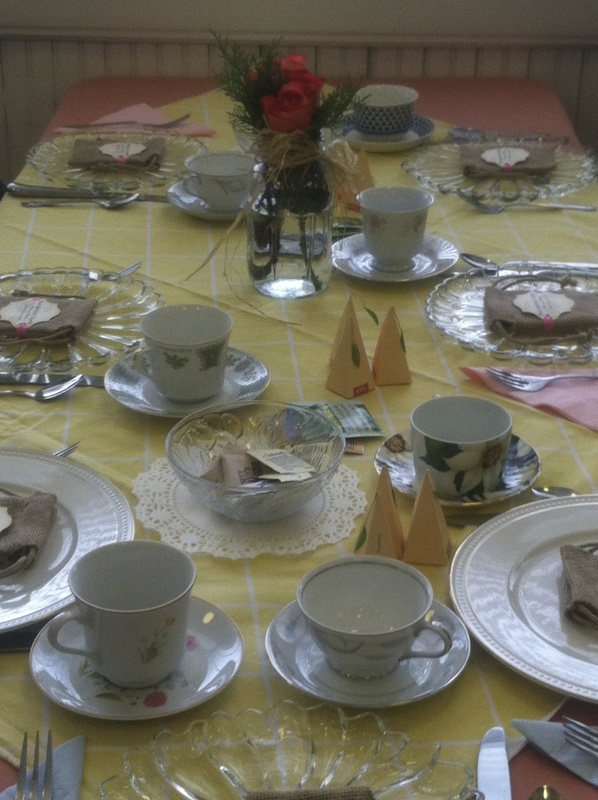 The teapots are not shown as they were warming in the kitchen awaiting their turn at the table. 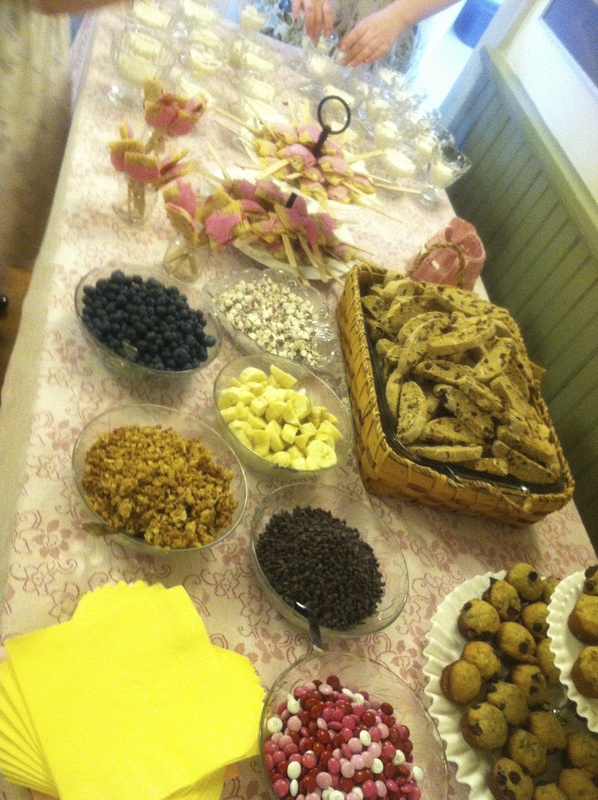 A lovely assortment of goodies was beautifully displayed on the food table. 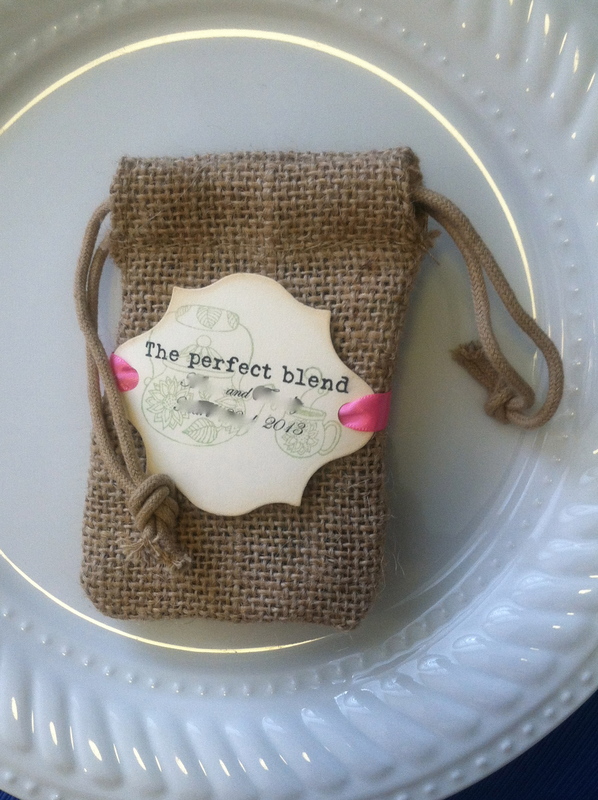 At each place setting a burlap bag favor was left for the guests. Inside the bag was a teabag. The beribboned label reads “The Perfect Blend” with the happy couple’s names and marriage date. What s cute idea! 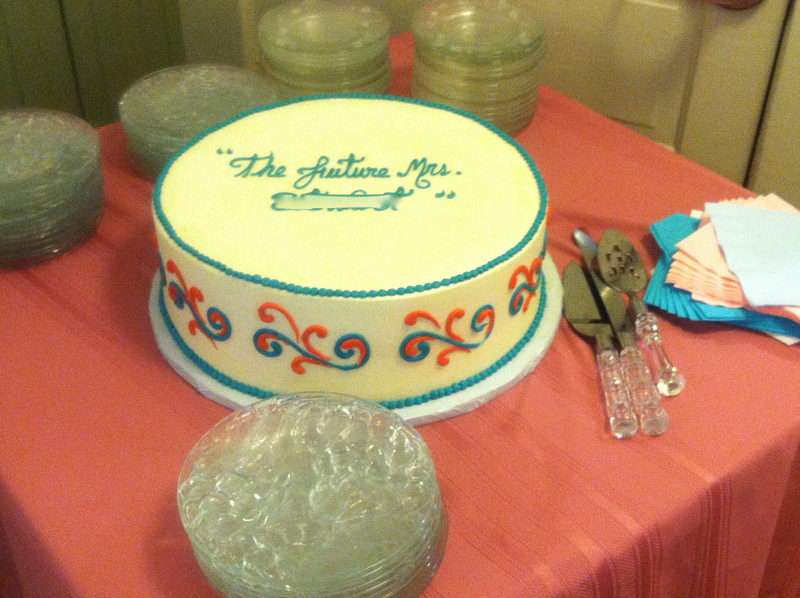 We also enjoyed a piece of this beautiful cake as a sweet ending to our tea. This tea was a true labor of love. All the components were toted from S’s home to the site of the tea – a local treasure – a recently renovated old school house used as a community center. 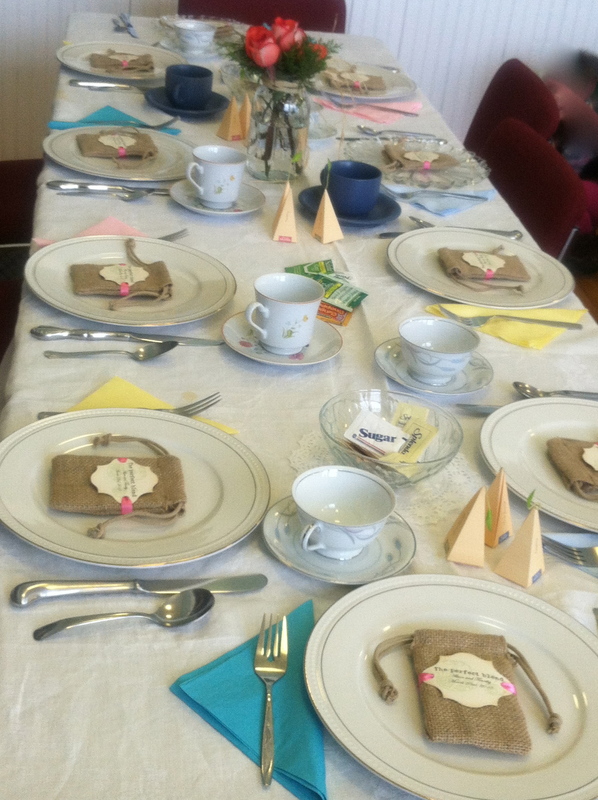 Food, dishes, table settings, tea pots and more were carried to the site. 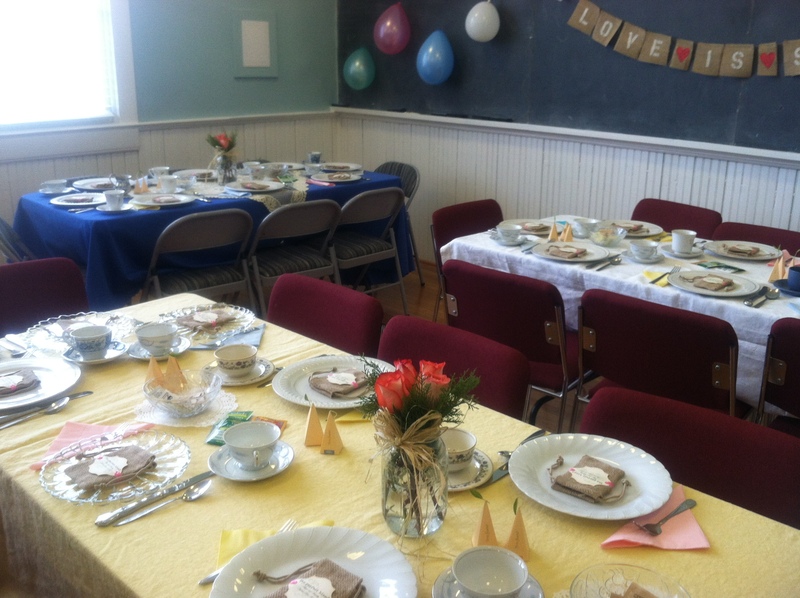 It was quite a whirlwind setting up for the tea with bridesmaids, parents, friends, grandmothers, aunts and uncles participating. It turned out beautifully, don’t you think? We all had such a wonderful time. I wish for my friend S’s daughter the most loving and happy of marriages. I hope to visit the parties at Knick of Time’s Knick of Time Tuesday, Nifty Thrifty Tuesdays at Coastal Charm, Thrifty Things Friday at The Thrifty Groove, and The Penny Worthy Project at Hey, What’s for Dinner Mom? 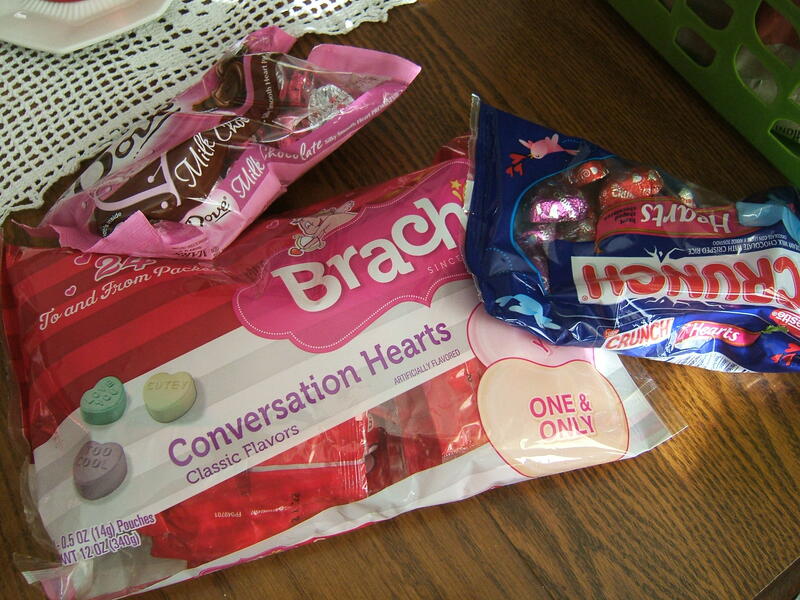 Yes, this is my Valentine’s Day table this year. 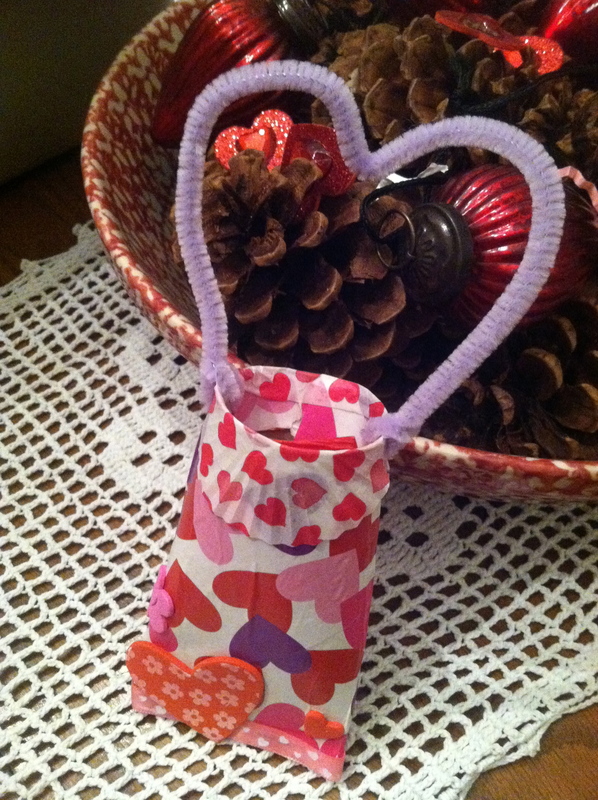 I created some little Valentines inspired by a pin on Pinterest. 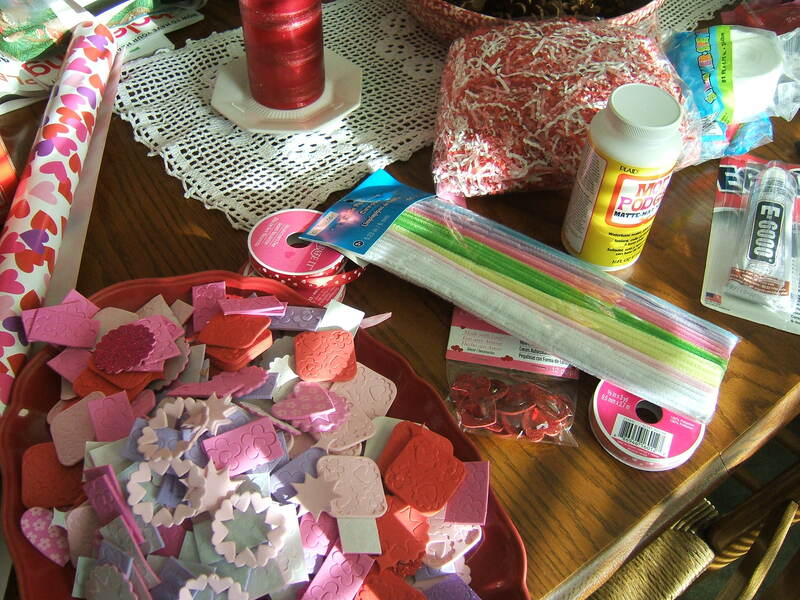 My dining room table looked like Cupid exploded. I hadn’t crafted in so long that most of my glue had dried up. I bought some new ModPodge but ended up using a nifty little craft glue stick I had in my stash instead. 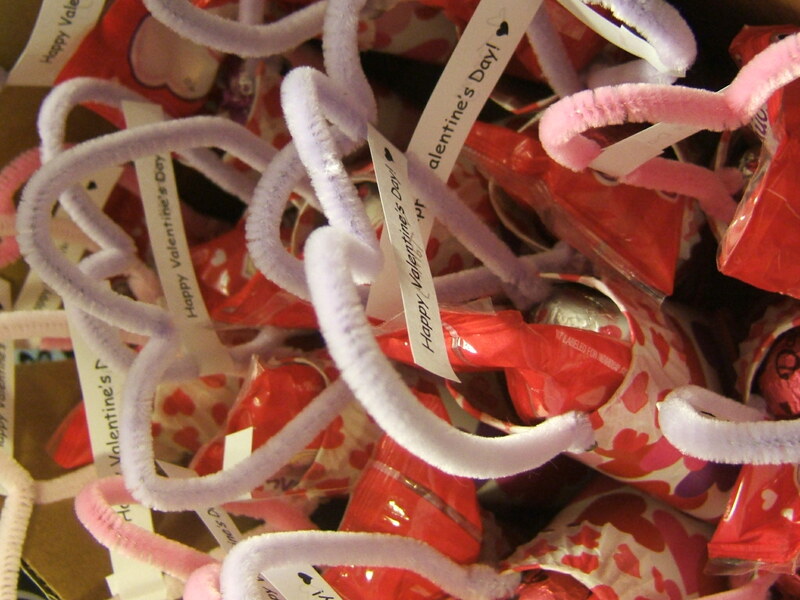 These treats were added to the Valentines once they were all dolled up in their Valentines’ bling. Here are some proto-types. 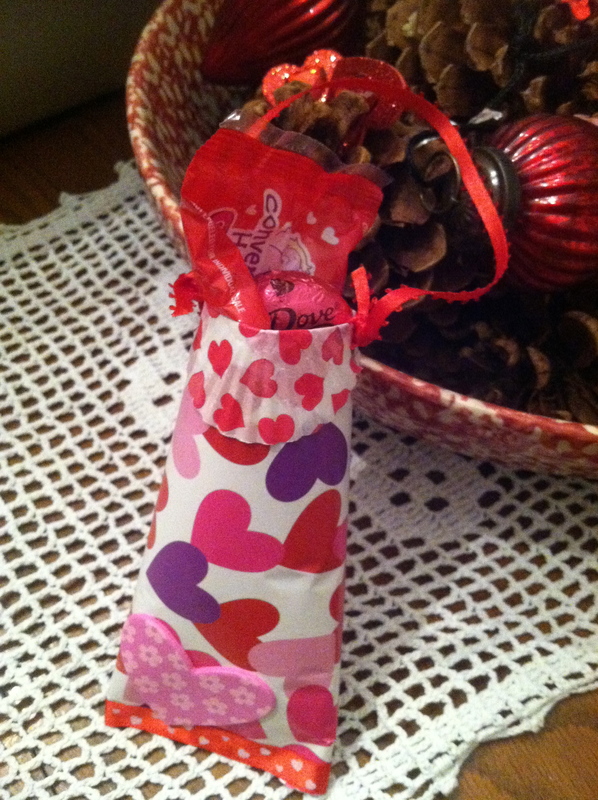 I created only one with the ribbon handle. I quickly realized the pipe cleaner (or whatever these things are now called) handle would be easier and could be shaped into a heart. I added a Happy Valentine’s Day tag. Here they are packaged up for delivery on the big day. So while this is not quite the traditional Valentine’s Day tablescape that one would expect, it was what our Valentine’s Day table looked like at Tammy Loves Dishes. I hope you enjoyed your Valentine’s Day. It’s a new year and with it a new chance to make needed changes and bring joy to others. 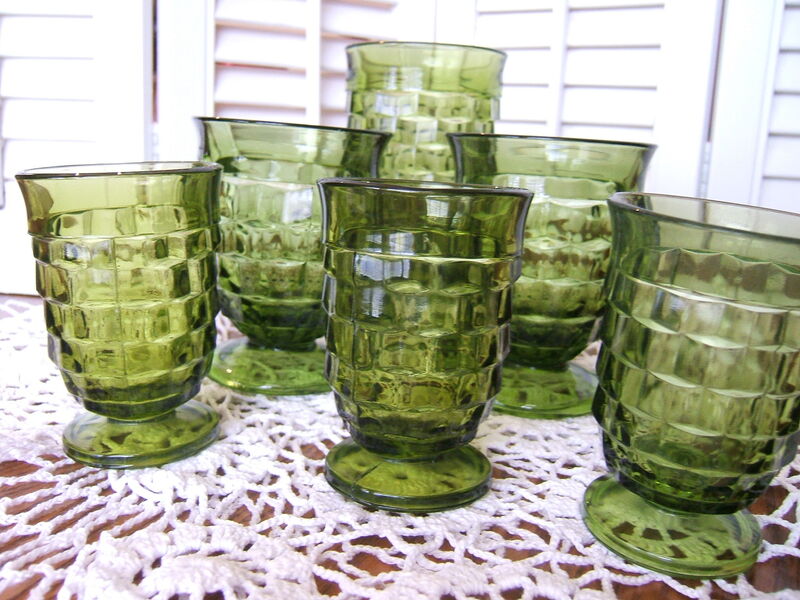 I was tickled to pieces to see these vintage green Whitehall Indiana Glass glasses my sweet friend ‘S’ gifted to me for my collection. I was glad there was no one in the mailroom at the time because I think I squealed out loud! These sure brought joy to my day. To prepare, we are beginning to make some changes in our collections. We have many, many years’ worth of “stuff” since we are both stuff savers. This year we plan to sort through our “stuff” and keep just what we still love. We want to have less clutter, less stress and less debt this year. I hope by minimizing our “stuff” we will be able to meet those wants and enjoy those items that mean the most to us. I have been trying to limit my thrift shop visits in the last few months. However, I just couldn’t let the first month of the year go by without stopping by the thrift down the street from the office. 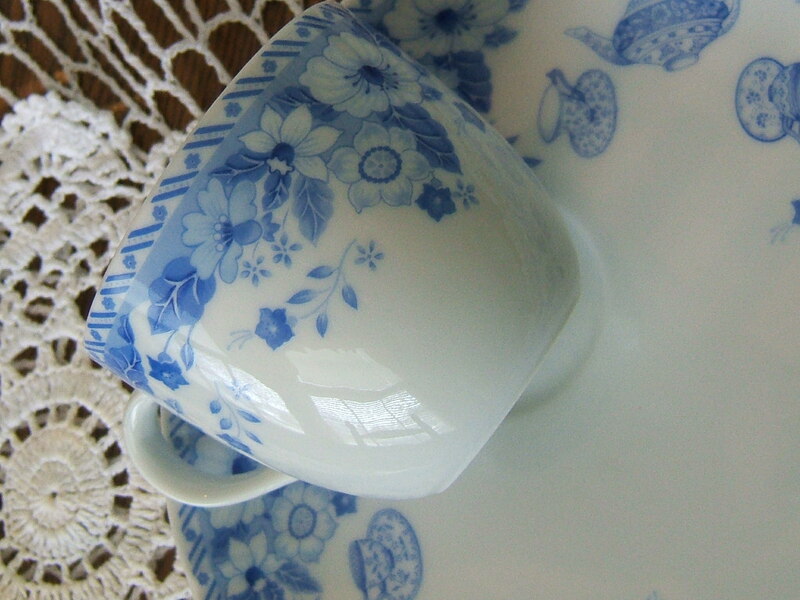 I was happy to find some fun things, like two blue and white snack sets from The English Tea Collection by Andrea by Sadek. Each set was $1.00. 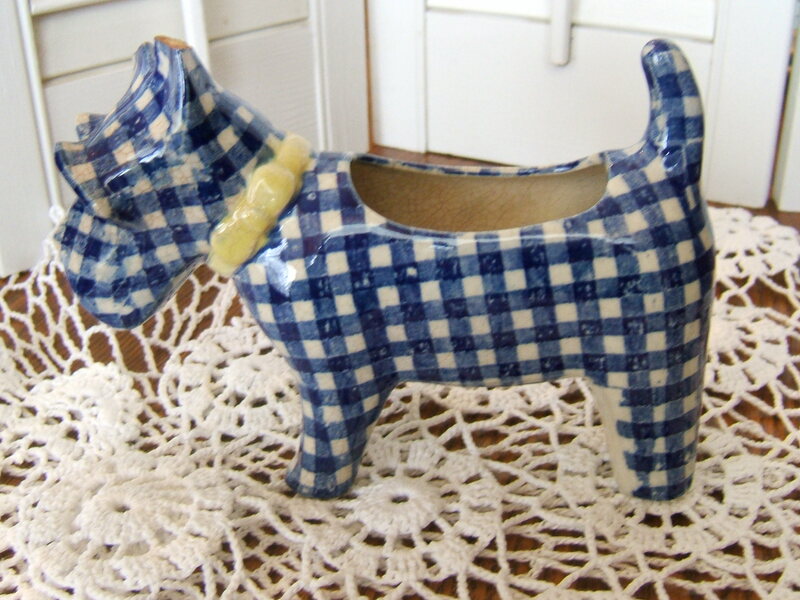 And when I saw this blue and white checked Scottie I could not pass him by. 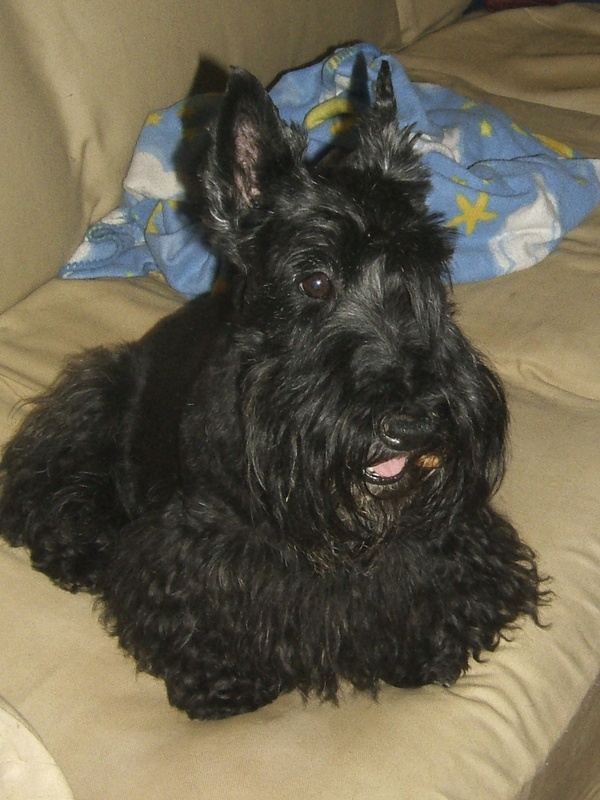 Yes, he did have his ears bobbed. Truthfully, I didn’t even notice this until my husband mentioned it to me. This little guy is marked Japan on his belly, but other than that I don’t know anything about him. Even with bobbed ears, I think $1.40 was a good buy for him. 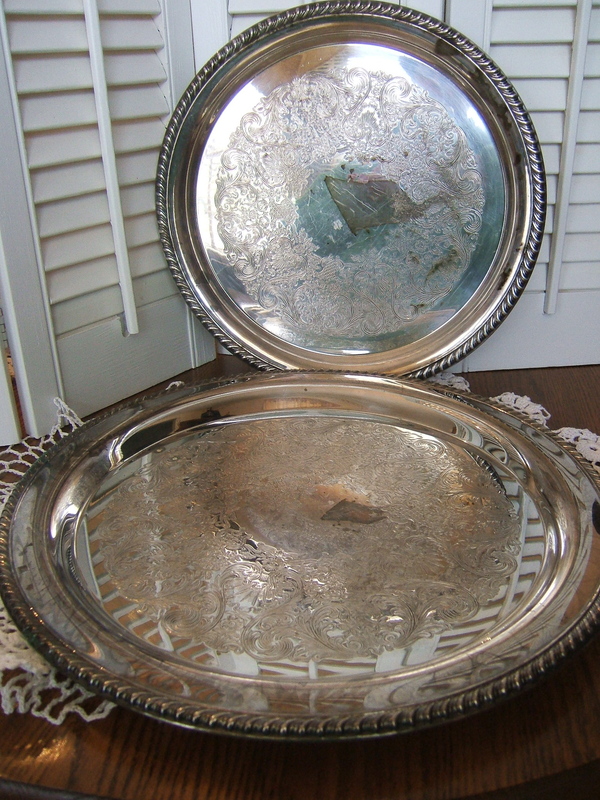 These silver-plated beauties have a few flaws that I hope will polish out. If not, at $3.55 and $4.55 I can certainly find uses for them. My addiction to Pinterest should help me with that. 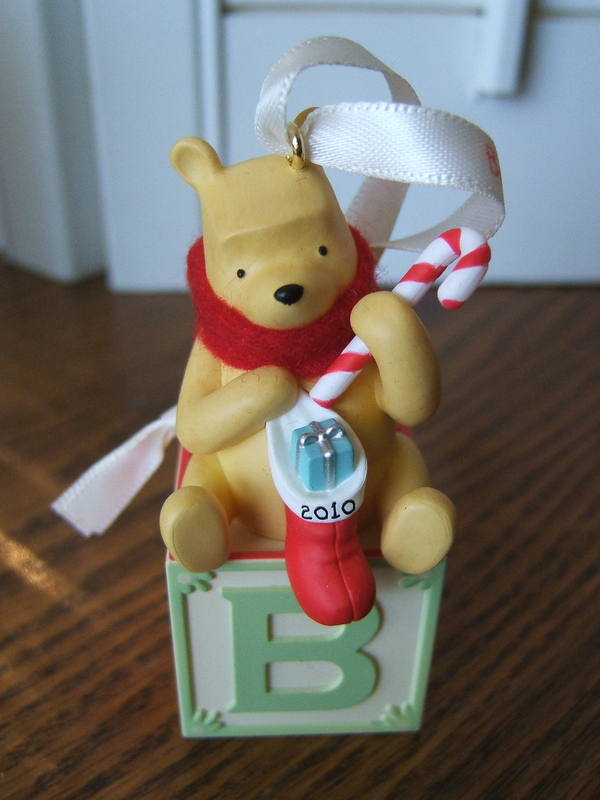 I also found a few Christmas items which will be used in future craft projects inspired by Creative Breathing‘s blog and a Winnie The Pooh, Baby’s First Christmas boxed ornament which I hope to list for sale. This year I will probably share with you some of the “stuff” we choose to release during the year. I’m not setting any specific number goals, although I have been inspired by the blog, 365 Less Things. I hope your year will be filled with changes you desire and much joy. Wishing those of you who celebrate Christmas a very Merry Christmas! This year we are having a very simple Christmas celebration with a retro-themed table. I used a white tablecloth found at a yard sale underneath the vintage Christmas tablecloth which was my grandmother’s. I also used my grandmother’s flatware. I used green charger plates (purchased on sale after Christmas one year at Walmart) and layered red Temptations Polka Dot dinner plates next. Topping the dish stack is a holly-shaped salad/dessert plate which was a thrift store find. 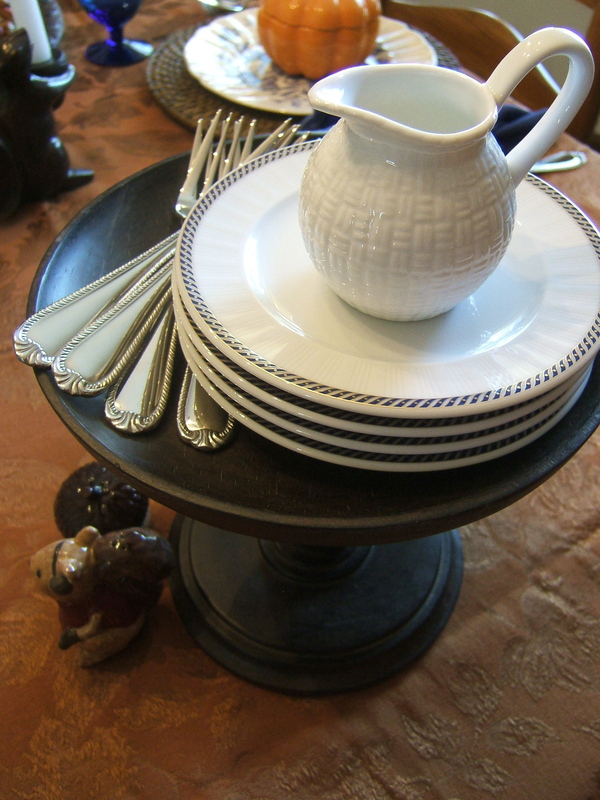 Yard sale treasures abound in this holiday tablescape. The Radko Christmas tree cookie jar was a yard sale find. It looks at home in the center of the setting. I have also used water goblets from a large set of glassware I found at a yard sale. Vintage metal poinsettia napkin rings are used on sweet red napkins – yard sale and thrift buys respectively. Here is a close up of the detail on the vintage tablecloth. This little Santa and Angel belong to my daughter. I love unwrapping this precious reminder of Christmas each year. May you and your family enjoy a loving holiday, creating memories which will make you smile for years to come. The American tradition of Thanksgiving is one of our finest. Gathering with friends and family, sharing family traditions, and remembering to be thankful for the many blessings we have available to us in our wonderful country are all part of this day. This year’s celebration was a smaller version than many previous years. 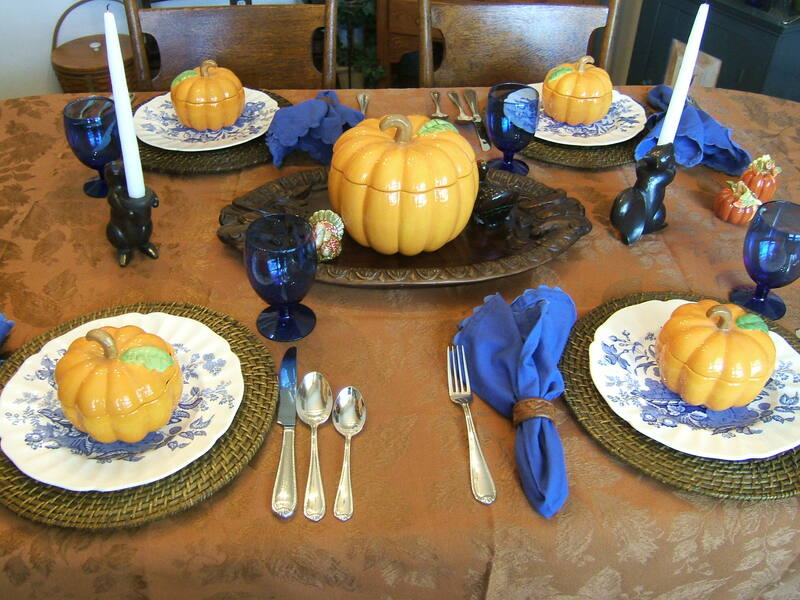 Our table was set in blue, brown and white with accents of orange. The plates and chargers were both yard sale finds. We really took a wild ride to end up at the site of the yard sale where I found these plates. I almost passed them up as the price was over my per-plate budget. 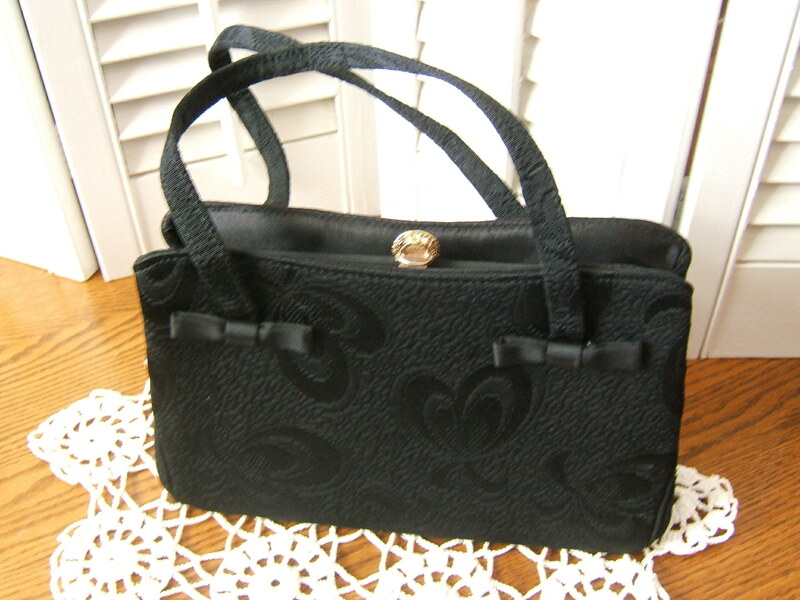 This was one time when walking away from the seller caused her to reduce her price. I was delighted as I really do love these plates! 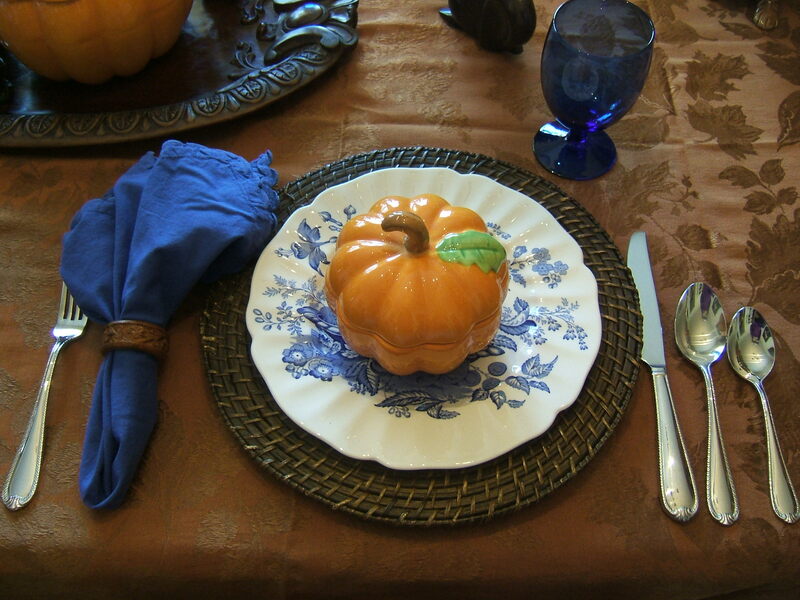 The pumpkin tureen and individual pumpkin bowls are Temptations pieces from QVC. The larger tureen sits on platter from the former Southern Living at Home collection. 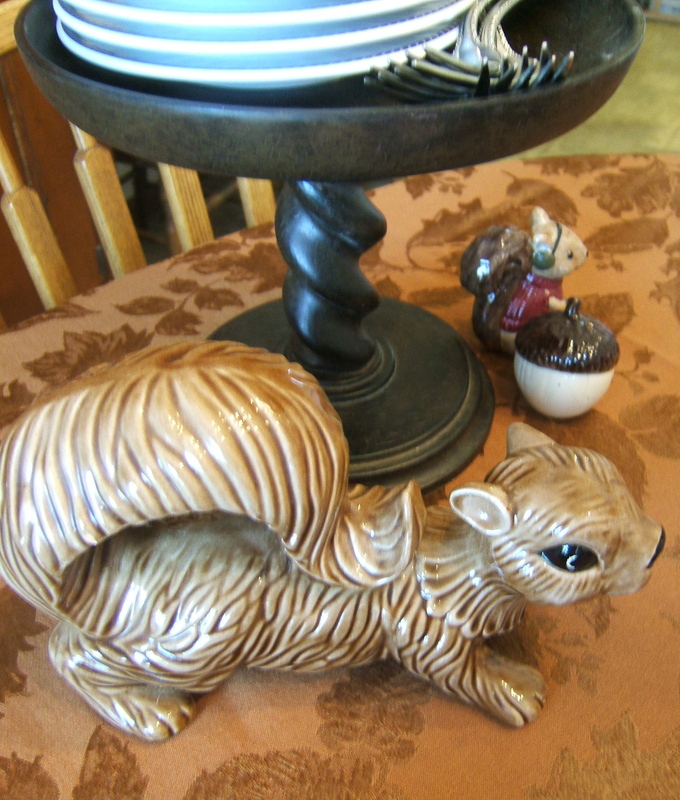 The squirrel candle holders were a find at the local hospital ladies’ board rummage sale. This plate stand holds our dessert plates on which we enjoyed homemade pecan pie. The stand is also from the former Southern Living at Home collection. The little cream pitcher is a thrift store find. Beneath the stand are a few squirrels who joined their candle-holding friends to keep watch on the setting. 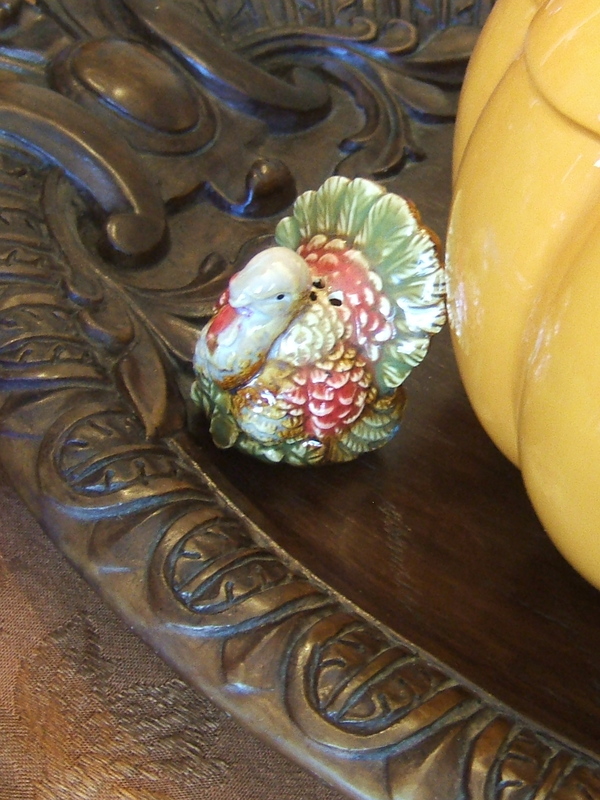 Also joining the table was this lone turkey salt/pepper shaker. 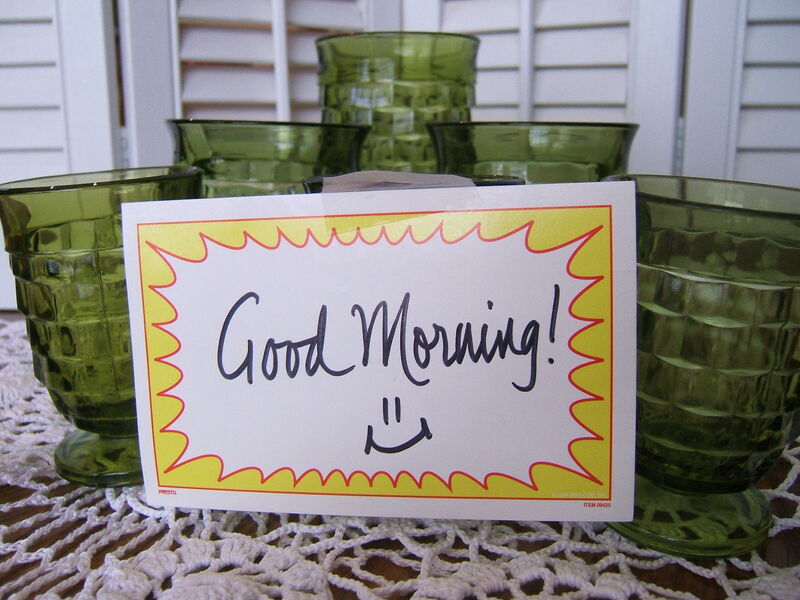 I hope you, too, can take time to consider the blessings in your life and be thankful. If you have time, I hope you will visit the parties at Her Library Adventures, Knick of Time’s Knick of Time Tuesday, Nifty Thrifty Tuesdays at Coastal Charm, Today’s Thrifty Treasures at Southern Hospitality, The Thrifty Groove, and The Penny Worthy Project at Hey, What’s for Dinner Mom?